I attended a sitting meditation two weeks ago. The instructor read a poem at the beginning. There was a phrase in the poem that has stuck with me, “bearing reality.” Mindfulness is about bearing reality, bearing the way things are right at this moment. Daily, there are difficult realities, especially at this time. I keep reminding myself that today’s reality is not necessarily tomorrow’s reality. But this is when it gets even more difficult. The joy of today can give way to heartache tomorrow. The fears of today can give rise to positive action. This is the bearing of possibility, the what could’s. As a psychologist and as someone who practices mindfulness, I know that living in the future is tricky business. It is important to visit future possibilities in order to plan. However, the future, though a good place to visit, is no where to live. The challenge, in our country, in our world right now is to bear it all. We must bear reality and possibility in balance. As with “baring it all”, “bearing it all” leaves us vulnerable. Right now I am considering my options for formal activism. I have done individual acts but I have not become a member of a group effort. I have been hanging out on the edges observing possible groups. There are a lot of them, by the way. Some of you may belong to one or more of what must be one of hundreds of resistance groups across the country. Since many of these groups cropped up after the election, there is an understandable amount of disorganization and flux. I am a practical person. I don’t want a “feel good” group. I want to be part of a “do good” group. I want to be effective. There’s a gamble no matter what I choose. Today, I am bearing reality. I am weighing my options. I am bearing possibility. These are scary and exciting times, these times of bearing it all. I was walking in my neighborhood last week and I passed two men. One of them had a newborn strapped to his chest in one of those little baby carriers. His baby looked blissfully asleep and his father looked like he was enjoying his time with his son. This is not an uncommon sight where I live. It was a rather uncommon sight when I was a girl. When I was young, a man changing his own child’s diaper was considered a rarity. Men played with their babies. They were not as involved with the day-to-day caretaking as they are now. Caretaking was considered “woman’s work” and therefore “beneath” a man. It still is, to a certain extent, but there really has been a significant overall increase in men’s level of involvement in their children’s lives not to mention an increased appreciation for “women’s work”. I have been providing mental health services to families for since 1991. When I started out this meant working with mothers and their children. Father participation was not common. It is far more common now and it is rare that I never meet with a child’s father. When I saw the man with his infant, I smiled in recognition of what our culture has gained from the women’s movement. There is still sexism. “Feminist” is still a “bad word”. But it is difficult to deny if I REALLY think about it that men’s lives have been improved by feminism. To know your children better and to be a nurturing force in a vulnerable being’s life are gifts. With the loosening of gender roles, I also think it is easier for gay men to be parents together. Civil rights and social movements are often met with resistance, the resistance that to give up a privilege is an absolute loss. That there is nothing to be gained through change. There is a lack of acceptance. Loss, perceived or actual, is often a sticking point. It is a place where we hesitate, trip, or in some cases, fall into a deep pit, for which climbing out is virtually impossible. Honestly, sometimes we want to stay in the pit even if climbing out is a possibility. We struggle. We suffer. We want to be heard, seen, and felt. At other times, we deny that we are in a pit. “What, this isn’t a pit? Everything is fine.” This is another kind of nonacceptance, and it too causes suffering. Denying and suppressing loss and the grief that comes with it, is a short term solution with painful consequences. In the world of cancer and other griefs, I see this acutely. In the world of cancer and other griefs, I see this acutely. It can be so difficult to find balance. It is so difficult to find the time and space we need to grieve our own losses and come to some kind of peaceful place with them. On top of that, there is no final destination. Grief is an iterative process, one that we must come back to over and over. This is why we can get on with life and yet not ever “be over” a significant loss in our lives. This weekend, I have been feeling anxious. I had awful nightmares last night. I feel justifiably underappreciated by my family. However, the way my impatience has played out in my behavior is a way that increases my suffering as well as that of my family. I came back to my well-spring. I did a sitting meditation and I am sitting her with my own thoughts and feelings, writing this post. I can feel myself letting go of hurt and anxiety. I am not quite solidly balanced, but I am getting there. I am nurturing myself and it is radiating within. When I leave this office and rejoin my family, I am hoping to radiate compassion toward them, as well. Today is Good Friday, a particularly good day to meditate on loss and resilience. I had a wonderful visit with my friend, Mike, a couple of days ago. He and I became friends in our teens. We were in the same woodwind quintet through a high school program at Cornish Institute in Seattle. He played French horn and I played flute. I continued to play through college at the University of Washington but not as a music major. Mike went off to Oberlin Conservatory and then the Julliard School. Our lives after high school diverged though I did see him a couple of times during college, when he came back to visit his parents. While I was becoming a psychologist, Mike was a professional musician. In particular, he played in the orchestra for a lot of Broadway shows. After about 20 years, he decided to study Chinese medicine and he currently has a practice in New York. Now I see us as doing similar things again; we are both healthcare providers. I think that’s pretty cool. Mike has been in Seattle for the last few weeks to be with his father during his last days. His father’s funeral was last Saturday. Mike’s mother died several years ago of ALS (Lou Gehrig’s disease). I was relieved to hear that his dad did not suffer horribly like his mom did. Mike has had some really big loses over the past year. Remember that I mentioned that he lives in New York City? Well, like many people in that area, he experienced the devastation of Hurricane Sandy. Mike also traveled around neighborhoods to help people. He inspired me with his FaceBook posts, describing the positive ways in which people were helping each other wade through chaos and fear. He reminded me of the Fred Rogers’ quote that went viral on Facebook after the Sandy Hook tragedy. When I was a boy and I would see scary things in the news, my mother would say to me, ‘Look for the helpers. You will always find people who are helping.’ To this day, especially in times of ‘disaster,’ I remember my mother’s words, and I am always comforted by realizing that there are still so many helpers–so many caring people in this world. Mike’s family is incredible. His parents, who were both born in the U.S., were forced to leave their homes during WWII because they were of Japanese ancestry. He and his family have continued to face discrimination as people of color. Mike is one of the most loving and kind people I know. Nonetheless, he and his partner, Dennis have faced discrimination as a gay men. I know that Mike has experienced many hurts in his life. But I am struck by his grace, resilience, generosity, and optimism. Mike and I have never discussed mindfulness though I know he practices meditation. I believe him to be a very mindful person, someone who does not ignore painful truths but who observes and accepts them. He also accepts the beautiful truths. I think this is what allows people to grow from hurt, instead of remaining stuck. Cancer is not something I would invite into my life, but I got it whether I wanted it or not. I do have control to a large extent, over how I live each day and how I incorporate these experiences into a meaningful life. There is growth that can come from adversity and as long as I am experience it, I might as well grow. I’m not a big believer in destiny as I am not much into the idea of pre-destination. How about the idea that hardships often prepare ordinary people for an extraordinary future? (Note that it says “often” and not “always”; let’s not bring that big old buzz kill, Nietzche into this.) Yeah, I know that it’s pretty nervy of me to mess with a quote from a most highly regarded Christian scholar. And I’m brazen enough to do it on Good Friday, too! 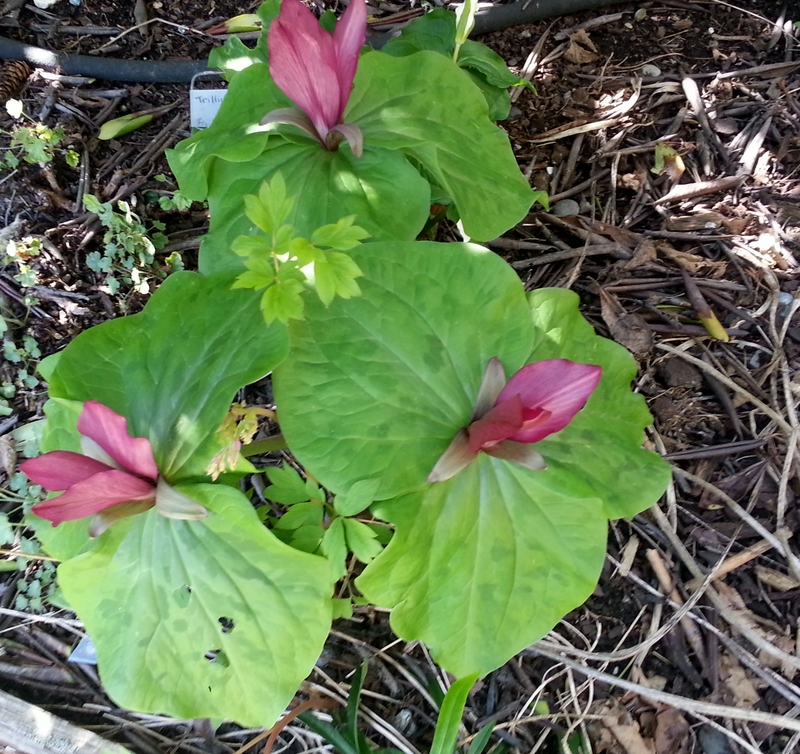 Trillium intertwined with budding bleeding heart. My garden is really cooperating with the theme of my post today. Trillium ovatum. 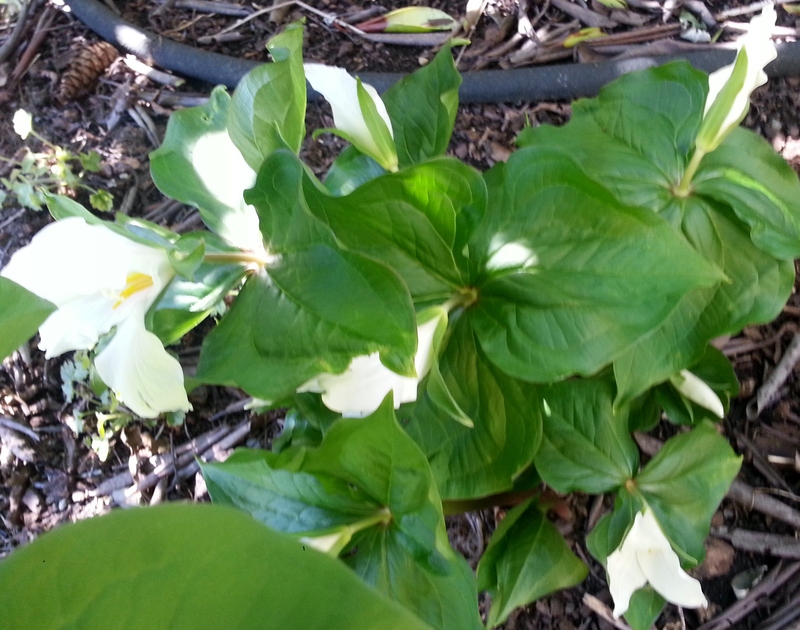 This trillium is native to our area. It’s three petals and the change in petal color from white to purple is often viewed as symbolic to the Lenten season. Lent and Easter are early this year so mine is still white. Helleborus orientalis. 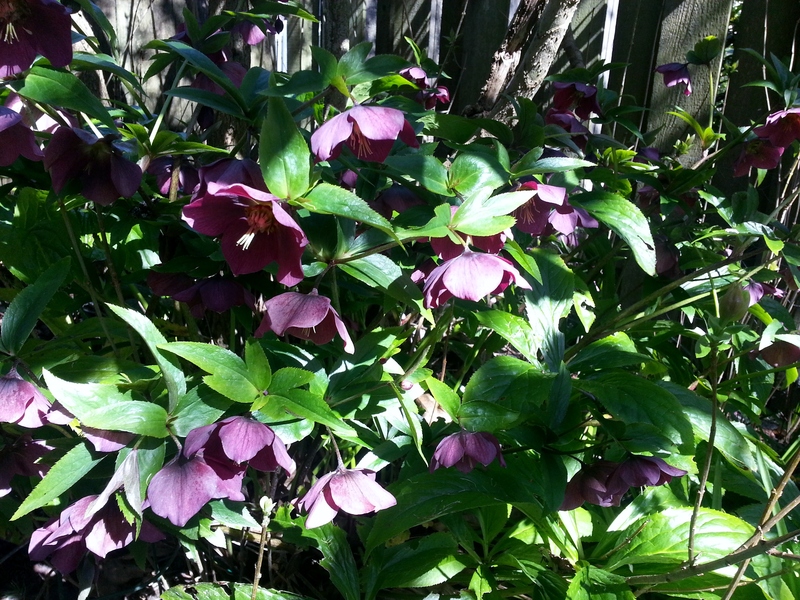 “Lenten Rose” If you are able to grow this plant in your area, do so as it is not only beautiful, but starts blooming in winter.